The festival in 2019 will be held from the 9th till the 11th of April in Riga, Latvia! 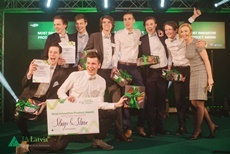 ISCF is an internationaly well known festival for Student Company programme participants which has gathered many great Student Companies and... in which we hope to see your Student Company participating as well! 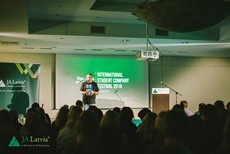 International Student Company Festival (ISCF) is one of the biggest Student Company events in Europe gathering together more than 100 Student Companies and their business advisers from the whole Europe. Each year the participants get to take part in a Trade Fair which is organized in a shopping centre during which they get evaluated by a jury consisting of different field specialists which gives the companies great experience and growth possibilties. During this Trade Fair the best Companies in the nominations and also the Company of the Festival is found and afterwards congratulated at the Award Ceremony. 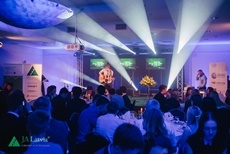 Also during the Festival the Teachers and Staff members get a chance to participate in the Teacher's Conference, and the students - in different activities organized by JA Latvia and their partners. Finnish teacher: "Thank you for these days - for all the fine work you had done. We will be back next year with new business ideas.The grade for you is EXCELLENT." Norwegian teacher: "Thanks for an overall good Conference! It is important to be culturally aware, the Conference is a very important arena for students to gain both business and cultural experience." be back next year with new business ideas.The grade for you is EXCELLENT.